It is with great sadness that I have to report the passing away of U Tin Win on 12 August 2014. U Tin Win has played a pivotal role in the scientific exploration of Myanmar freshwater fishes and in the development of the ornamental fish export business in Myanmar. I met this remarkable man in January 1996 when I visited Myanmar for the first time. During one evening in Yangon while sitting in one of the street stalls on the side of one of the main roads with their typical tiny stools and tables, a group of Yangon University students approached my friend and me to practice their English. When we talked about our interest in freshwater fishes and mentioned our intention to collect some for scientific studies, they told us about their chemistry professor who was crazy about ornamental fishes and who we would have to meet. A meeting was arranged for an evening a few days later. This is when I met U Tin Win face to face. I saw myself opposite a very friendly man in his early 50s and we immediately connected and spent hours chatting about freshwater fishes – those of Myanmar in particular- and how little we knew about them. We talked about going into the field together and collecting some of the elusive fish species which had lead me to come to Myanmar in the first place, such as the paradox fish or toothpick fish, Indostomus paradoxus, or Myanmar’s chocolate gourami Parasphaerichthys ocellatus. I mentioned to him that many of the smaller colourful fishes would make perfect species for the ornamental fish markets in Europe and other parts of the world and that a well-functioning export business may be an interesting option for someone with his interest and passion. Soon after our meeting I had to leave and we lost contact for a couple of years, as the easy way of communicating by e-mail was still quite uncommon in Myanmar. Six years later in late 2002 I received an e-mail message from U Tin Win completely out of the blue. He had successfully used the web to track me down and get in touch. He informed me that he had since retired from university and had started an ornamental fish export business which was doing very well. After a few emails back and forth he and I started to plan my next collecting trip to Myanmar and in February 2003 I landed in Yangon and met U Tin Win again. For this and all subsequent trips U Tin Win has provided invaluable advice which turned every visit into an extremely successful collecting trip during which numerous new species have been discovered. 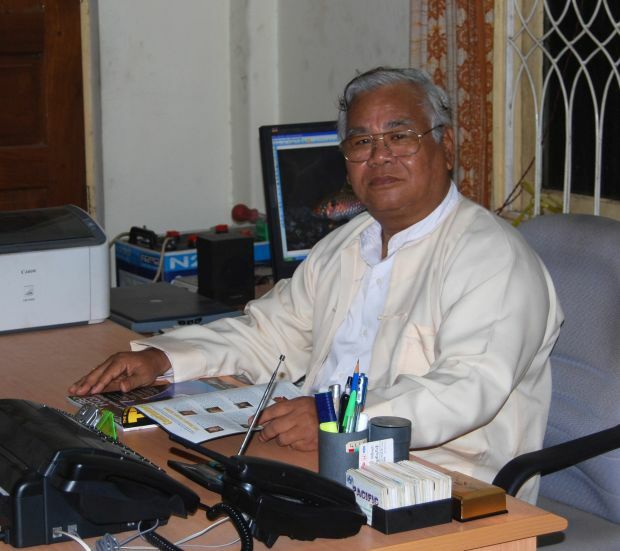 U Tin Win’s deep knowledge of and passion for Myanmar freshwater fishes, their taxonomy and distribution and his insatiable thirst for new information about them made him the single most knowledgeable fish expert in Myanmar. With great anticipation and patience would he await letters or emails informing him of the latest descriptions of new species from the Myanmar freshwater fish fauna. He was always eagerly awaiting a set of reprints that I handed over to him when I visited his fish farm at the start of each collecting trip. He would read them carefully and frequently produce a little summary accompanied by his own observations for the journal of the fisheries department, with which he had excellent contacts, thus helping to spread the latest information with little delay. He must have written dozens of this type of articles over the years reporting recent discoveries and explaining taxonomic and nomenclatural changes. These articles have always been greatly appreciated by all fisheries staff. U Tin Win was born on 24 June 1944 and his interest in fishes already awakened at the early age of 8 when he kept aquarium fishes. During his subsequent life he was mostly concerned with exotic aquarium fishes and he bred various fish species including discus and angel fish for the local market. 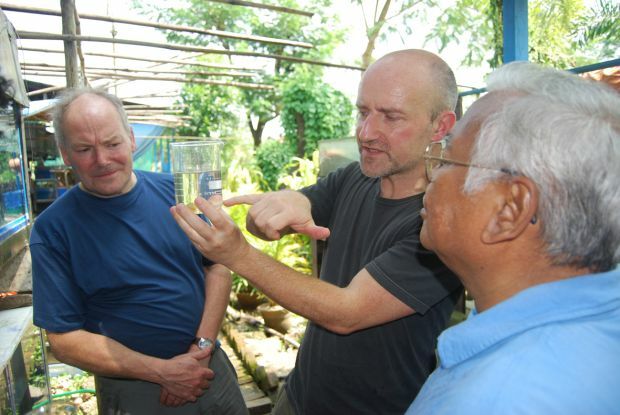 He was also the first breeder of oscar cichlids in Myanmar who was able to reproduce them in quantity. His main focus and interest continued to centre around exotic aquarium fishes until we met up in 1996 and he began to expand his interest to include Myanmar’s freshwater fish species in general, and the ornamental fishes of this amazing country in particular. He started his company Hein Aquarium in 1998, with the help of some of his students, his wife Daw Tin Pyone and his young son Ye Hein Htet. Hein Aquariums first shipments left with Bangkok as their destination and the miniature Inle Lake cyprinid Danio erythromicron was among the first fish species exported. 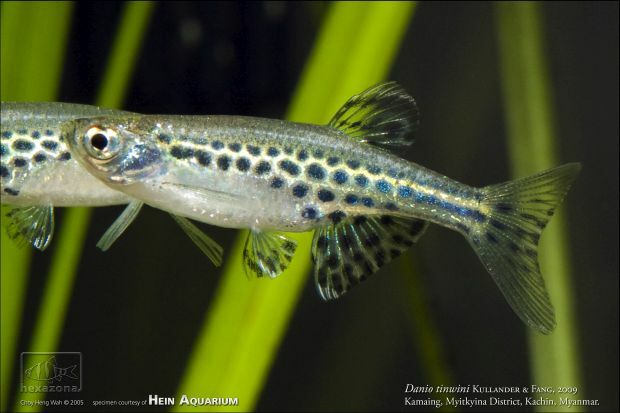 U Tin Win was also responsible for the rediscovery of a long forgotten little fish, Danio choprae, a colourful relative of the zebra danio, for which he suggested the trade name glowlight danio. When the newly discovered Danio margaritatus, the Galaxy Danio, was claimed to be highly endangered after it had been exported in large numbers it was U Tin Win, who went out to search for it in other areas and to prove that the locality where it was first collected was only one of several places where it occurred. Both species are now some of the most popular aquarium fishes from Myanmar. The appreciation of U Tin Win’s expertise and knowledge and of the help he offered foreign ichthyologists is also evidenced by two new species discovered by and subsequently named after him: Mastacembelus tinwini, a large spiny eel from across Myanmar, and Danio tinwini, a pretty little danio from small mountain streams in the Kachin State. His name is mentioned in the acknowledgements of countless scientific publications describing new fish species from Myanmar in the last 15 years. U Tin Win was also instrumental in the rediscovery of an enigmatic catfish species described from Lake Inle in 1967. This species had not been found after its discovery and the type specimens had been lost. Information on this fish was restricted to the contents of the original description. Once U Tin Win’s interest had been aroused he put his patient but indefatigable mind towards finding this fish. It took months and the offer of a substantial award until a fisherman brought him a specimen, which U Tin Win proudly presented to me during one of my visits. Once I held this fish in my hands it was clear that the systematic assignment of this catfish based on the little information in the original had been erroneous and we set out to correct this error in a paper, which appeared in Oct 2010 (Britz & Tin Win). I could add numerous additional stories about U Tin Win’s role in the exploration of the freshwater fishes of Myanmar, but none would give justice to this remarkable, international man he was. He will be sorely missed not only by me but by a number of ichthyologists, and aquarium fish enthusiasts all over the world.